Creating a beautiful and well-designed understory can be a challenging and daunting task in the dry summer climate of the Pacific Northwest. Often, an evergreen canopy adds to the difficulty, but does not make it insurmountable. 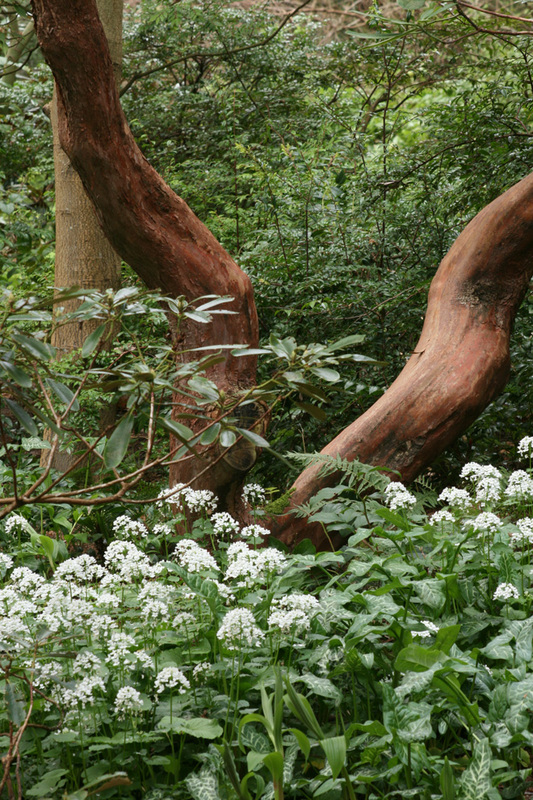 Through thoughtful plant selection and adhering to a few guidelines, any woodland can be turned into a garden oasis. A beautiful understory begins with taking note and observing the overstory. Trees are not indestructible, and can suffer if there is excessive root damage caused by rototilling or digging large areas. Work with several small planting pockets rather than digging up large areas to avoid severely damaging or cutting large roots. 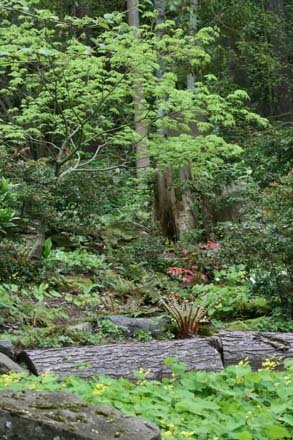 An example of the rich diversity that’s possible in a shady woodland planting. Also, many Western tree species will not tolerate summer watering. The most important part of building an understory is to know what types of trees make up the canopy and knowing their water tolerances. The relationship of tree roots, soil, and decomposing leaves is a complex ecosystem and the plantings you add should complement this process and not hinder its development. Assess how much light and water is available. All this will help you decide when to plant and how to select the best plants that will survive and thrive in the understory. 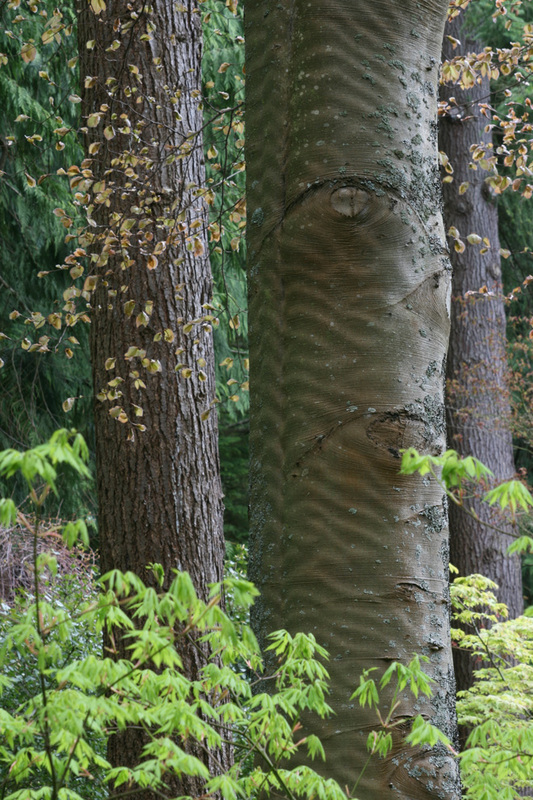 The trunks of trees are a powerful and dominant design element. Understory plantings using one of this or two of that are lost against the strong structure of trunks. Plant in drifts and groups, and then complement these drifts with a few focal-point plants. This will help create a flow and unity with the existing trees. Do not forget to add a few taller (6- to 20-foot tall) trees and shrubs to fill the mid-canopy level. These taller plants add a sense of depth and transition. Groundcovers. Groundcovers are perfect for adding repetition and linking the woodland space together. There are several West Coast natives that thrive for us and tolerate dry conditions through the summer. One of my favorites is wild ginger (Asarum caudatum). The dark evergreen leaves have a beautiful heart shape and a wonderful spicy fragrance. 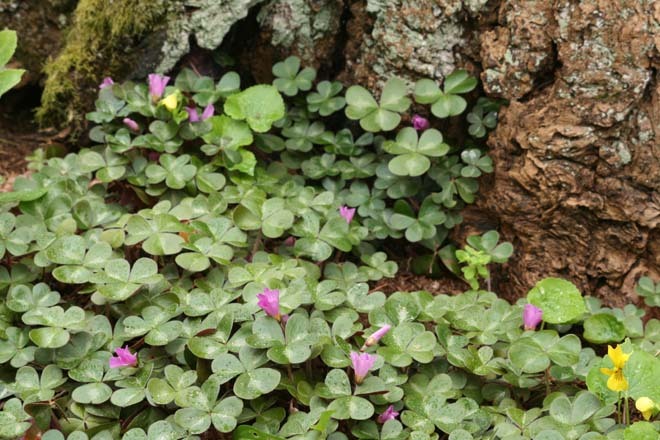 If you need to cover a substantial area quickly, use inside-out flower (Vancouveria hexandra) or wood sorrel (Oxalis oregana). Both have beautiful foliage and charming flowers, but warning: both can be thugs and are not for the small space. If you are worried about a hostile groundcover takeover, choose their much less aggressive evergreen relatives redwood ivy (Vancouveria planipetala), or Oxalis oregana ‘Wintergreen’. Both of these are slow to spread, with rich dark green foliage, and a low compact habit. They are more difficult to find, but are well worth the effort. Several barrenwort (Epimedium spp.) trace their roots back to Southern Europe and the Mediterranean region. Epimedium ×perralchicum, E. pinnatum ssp. colchicum, E. ×warleyense and E. ×rubrum are all evergreen and very drought tolerant. These tough perennials form tight, spreading mats that will keep most weeds at bay. The only disadvantage to using these in very shaded sites is that the flowering is reduced, but the foliage looks great! For smaller areas I use the tiny leafed Euonymus fortunei ‘Kewensis’, which forms a dense cover of small leaves on wiry stems, giving a somewhat shaggy, bad-hair-day appearance. Flashy foliage. Hostas are a natural go-to plant for shade, but I find they tend to languish under the dense shade of our conifers and yearn for warmer summertime temps than the Pacific Northwest can typically provide. For bold leaves in our dry shade, one of the best is Trachystemon orientalis, a Turkish borage relative with handsome blue flowers in spring followed by large, bright green, hairy leaves through the growing season. I also rely on the some of our more common but tough shrubs such as Fatsia japonica and Aucuba japonica. In their typical form, they have deep green, shiny leaves that sparkle in the woodland, but there is an increasing range of variegated selections that add brightness to dark corners of the garden. Another native to the woodlands of Turkey is Pachyphragma macrophyllum, big-leaf winter cress. Snow-white flower spikes emerge in late winter over large, round, shamrock-green leaves. The flowers bloom into mid-spring and can gently self-sow into attractive drifts (excess seedlings are easily removed). Woodland Ferns. No woodland garden is complete without ferns. The diversity and beauty of these plants is unparalleled for foliage. There are several large ferns that make excellent focal point specimens. Dryopteris ×complexa, hybrid male fern and D. affinis, the golden-scaled male fern, are two stellar performers. Both can reach 3 to 4 feet tall and form a graceful upright arching silhouette. These tough ferns compete well with tree roots. Another great large fern with a completely different form and texture is the royal fern, (Osmunda regalis). The cultivars ‘Purpurascens’ and ‘Cristata’ are particularly vigorous, with broad spreading fronds in shade. Royal fern is a wetland native but is surprisingly tolerant of dry conditions. The soft shield fern (Polystichum setiferum) adds a graceful touch to the garden. There are several cultivars of this elegant, evergreen fern. Some of the most popular and widely available are in the Divisilobum Group. They are easy to grow and have finely divided foliage, creating a soft, hazy, dark-green mound. There are many other soft shield fern cultivars available and all of them seem to tolerate a dry shady location. Two other Polystichum species that are stellar performers in the woodlands are the narrow, shiny-leaved P. neolobatum and the broadly arching and vigorous hybrid P. ×dycei. Of course, Pacific Northwest native ferns cannot be beaten for tolerating dry shady conditions. Two top performers are Polystichum munitum, Western sword fern, and Dryopteris expansa, spiny wood fern. Sword ferns are ubiquitous in the maritime West. Their robust growth (up to 4 feet tall and wide) and stately habit is matched by few other ferns. The spiny wood fern is a much subtler fern, with finely divided fronds typically reaching 2 feet in height (with some specimens in moist areas topping out at over 3 feet). Superficially, it resembles our weedy lady fern, but it is evergreen and retains a slightly more elegant habit. 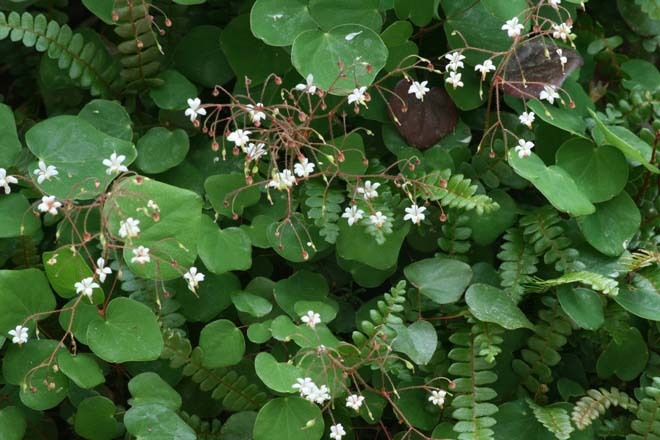 For Northwestern gardeners, the array of great understory plants is varied and rich. If you can add extra water during dry periods your palette only expands. 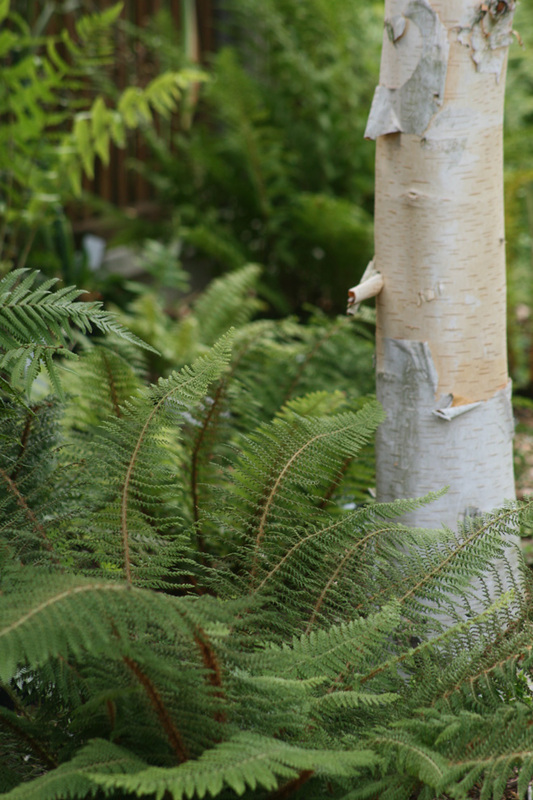 With careful selection and using a few design principles your woodland can look charming, well thought out, and pleasingly inviting.